Red Bank’s Kyle Harper faces Notre Dame's Josh Deitch at 113. Notre Dame won the battle, but Red Bank won the war. These two proud teams squared off at Notre Dame’s Jack Steiner Sr. Gymnasium for a non-district wrestling match. It was also a reunion event for former Fighting Irish wrestlers and coaches, so there were a lot of smiling faces present. Notre Dame ended up winning seven of eight matches, but the Lions were the team winner by a 36-34 final after the Irish were forced to forfeit five weight classes. Caden Cline had Red Bank’s only win in a contested match as he won his match at 160 pounds with a pin at the 1:32 mark of the first period. Those 30 forfeit points were more than the Irish could overcome. “I couldn’t be more proud of the effort my guys put out there as we won seven of the eight matches we wrestled. You can’t ask for a more dominant performance,” said Notre Dame first-year head coach Tim Voiles after his team’s overall record dropped to 6-11. “It came down to all the forfeits, but not a bad performance for a bunch of first-year wrestlers. We scrapped and gave everything we had. I can promise you it won’t be this way forever. I have a huge smile on my face right now as I don’t feel like we lost anything,” Voiles added. The match began at 106 pounds with Bob Deitch getting a first-period pin and giving Notre Dame a 6-0 lead. 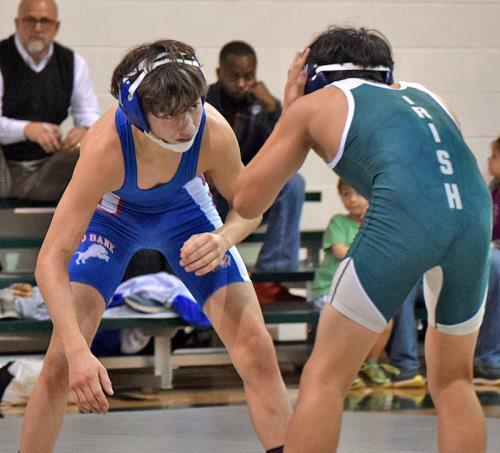 Younger brother Josh Deitch made it 9-0 with a 12-7 decision at 113 before Cade Holloway extended the winning streak to three matches with a second-period pin at 120. Fran Palacio made it 19-0 with a 17-8 major decision at 132 before Ben Perry got Red Bank’s first points with a forfeit at 138. Blake Hopper got a forfeit for the Irish at 145 and Jalen Hagood was a winner by 9-3 decision at 152 before Cline cut the Notre Dame lead to 28-12 with his pin at 160. Four straight forfeits gave Red Bank a 36-28 lead and more than enough points to prevail before Notre Dame’s Jacob Brigman ended the match with a 1:34 pin in the heavyweight match. Red Bank coach Nathan Wehunt really didn’t have much to say after the match as he was somewhat embarrassed by his team’s performance. “I guess that we just had more kids. I’m glad we got those forfeits because we only won one match and really didn’t wrestle very well,” he explained after his team improved to 10-7 with the victory. “Notre Dame was meaner and tougher than we were tonight and most of our losses came from mistakes that we made. But they’re trying and that’s all I can ask,” he added. 285 – Jacob Brigman (ND) pinned Cole Stevens, 1:34. 285 -- James Headrick (W) won by forfeit.